Today we celebrate two sets of people who gave attention to the body of our Lord Jesus Christ after His crucifixion: the Myrrh-bearing Women and two men who followed Jesus—Nicodemus and Joseph of Arimathea. It is this last figure, Joseph of Arimathea, whom I would like to address especially today. I will be largely following what St. Theophylact of Ochrid says about this passage, as he is a well-known and trusted patristic commentator who mainly summarizes what St. John Chrysostom says. Joseph of Arimathea, a respected member of the council, who was also himself looking for the Kingdom of God, took courage and went to Pilate, and asked for the body of Jesus. And Pilate wondered if He were already dead; and summoning the centurion, he asked him whether Jesus was already dead. And when he learned from the centurion that He was dead, he granted the body to Joseph. And he bought a linen shroud, and taking Him down, wrapped Him in the linen shroud, and laid Him in a tomb, which had been hewn out of the rock; and he rolled a stone against the door of the tomb. Mary Magdalene and Mary the mother of Joses saw where He was laid. 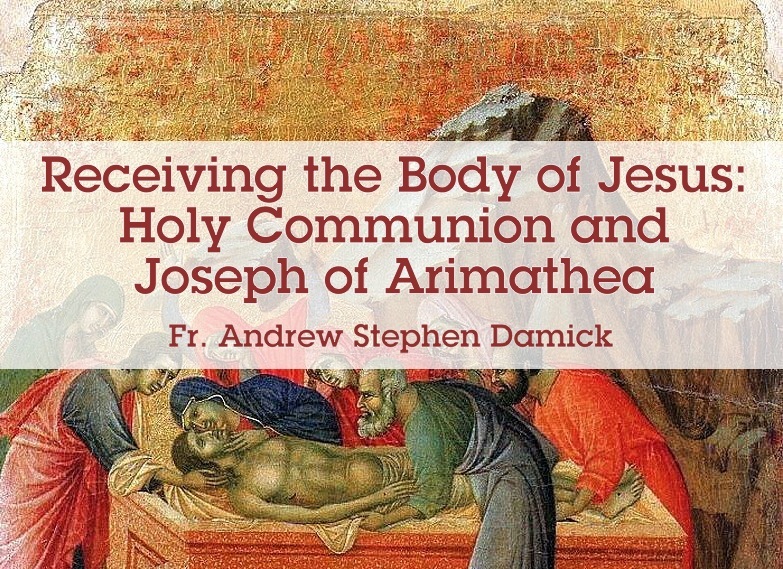 From this, we learn a few things about Joseph of Arimathea. He is “a respected member of the council,” that is, he is a local civil ruler. Theophylact says that he helped to regulate the local marketplace, which made him subject to many temptations. Yet he was nevertheless able to live a virtuous life. The Gospel also says that Joseph was “looking for the Kingdom of God.” Theophylact does not comment on that point, but we can still ask what this means. We noted that Joseph was a civil leader, but he is also “looking for the Kingdom of God.” He is, in other words, not content merely to help manage his corner of an earthly kingdom. He is seeking what is to come. His life is oriented toward the coming of the heavenly Kingdom. He is a man living only tentatively in this world because he seeks citizenship in a world that is coming. Let’s return now to Theophylact. He does something really interesting with this passage that would not have occurred to me otherwise. When Theophylact sees the care with which Joseph asks for and then provides for the burial of the body of Jesus, he does not see simply acts of piety, honor and love—though that is certainly happening here. Rather, Theophylact draws a parallel with the act of receiving holy communion! Stay with me here. First, he says this: “And let us also take the Body of Jesus, through Holy Communion, and place It in a tomb hewn out of a rock, that is, place It within a soul which always remembers God and does not forget Him.” Not only can we think about the hardness of a rock as being a symbol of a steadfast soul, but Theophylact is actually making a pun here—in Greek, the word for “tomb,” which is mnimeion, is derived from the Greek word for “memory.” So when we receive communion, we should receive it in such a way that we always remember that God is within us. He then focuses on the rock itself, writing, “And let that soul be hewn from a rock, that is, from Christ Who is the Rock on which we are established.” There are several places in Scripture where Christ is called the “rock.” And it means here that He is a firm foundation. So the soul that is like a tomb hewn out of a rock is a soul whose shape is founded upon Jesus Christ. When we receive holy communion, we have to be purified in order to receive it properly. This does not mean that we must be utterly sinless, for that truly is impossible. We sin so often that we cannot even remember all our sins. But like Joseph, we should be “looking for the Kingdom of God.” That is, we should be oriented toward Christ’s Kingdom. And so that will be manifest in how we live both in the body and in the soul. And it also means that when we sin, we purify ourselves through repentance and through confession. We cannot take communion lightly. It should never become mere routine. We are placing the Body and Blood of the God-man Jesus Christ within ourselves! Thus we exercise as much care and reverence as Joseph did when placing the body of Jesus into the tomb. Communion is indeed hidden within us. We generally keep it veiled even before we receive it—it is hidden inside the chalice or beneath the veils used over the Holy Gifts. And then it is all consumed by the clergy after the Divine Liturgy. Why the veiling? Why do we not take it out and show it to the world, parading it openly to announce to the world that Christ is present here? It is because of what veiling communicates. It communicates that something truly precious is within. And it also communicates that something very intimate is happening in communion. It is not presented to the world but only to the people of God, to the Body of Christ. There is of course a Gospel proclaimed openly to the world, but Holy Communion is the consummation of receiving the Gospel. Just as Christ’s body was placed in the tomb only after He said “it is finished,” so must Christ’s body be placed within us only after the work has been finished of uniting us to the Church and purifying us in preparation for this moment of intimacy with our God. This is a different way of interpreting Scripture than we are perhaps used to, but I find it beautiful and powerful. Theophylact uses a story we are familiar with and which still is echoing for us in our minds in the wake of the poignant services of Holy Friday, and he uses it to tell us something about the spiritual life. Just as Joseph of Arimathea used great care in burying the body of Jesus, placing it in his own tomb, we also should take great care in receiving the body of Jesus into ourselves when we commune at the Divine Liturgy. Brothers and sisters, we have shared together these precious mysteries these past few weeks, witnessing our Lord Jesus’ passion and death, culminating in His radiant resurrection from the dead. Let’s continue to meditate on what we have seen, take it into ourselves, and make it part of who we are. In this way we will become like Joseph, “looking for the Kingdom of God.” We will be people defined by having our faces turned toward that mystical East, looking always for the coming of Jesus, and preparing ourselves to receive Him. To the risen and coming Lord Jesus Christ, with His Father and the Holy Spirit, be all glory, honor and worship, now and ever, and unto ages of ages. Amen. Christ is risen! Truly Christ Has Risen. Thank you Father. Beautifully said. That’s a beautiful connect between Joseph receiving the Body of Christ and us also receiving the Body of Christ but, in Mark, that’s not what happens. Joseph asks for the body from Pilate, but receives the corpse, a deliberate change in words. I honestly don’t think that really matters to St. Theophylact’s interpretation. And that’s who I’m following here.